The 2018 edition of an international seminar revolving around the impact of war on woman, family and environment was held in Tehran on Tuesday, in the presence of a dozens of government officials and foreign ambassadors. The conference, titled International Seminar on Post-Conflict Effects on Women, Family and Environment, was held on the occasion of the International Day for Preventing the Exploitation of the Environment in War and Armed Conflict, November 6. 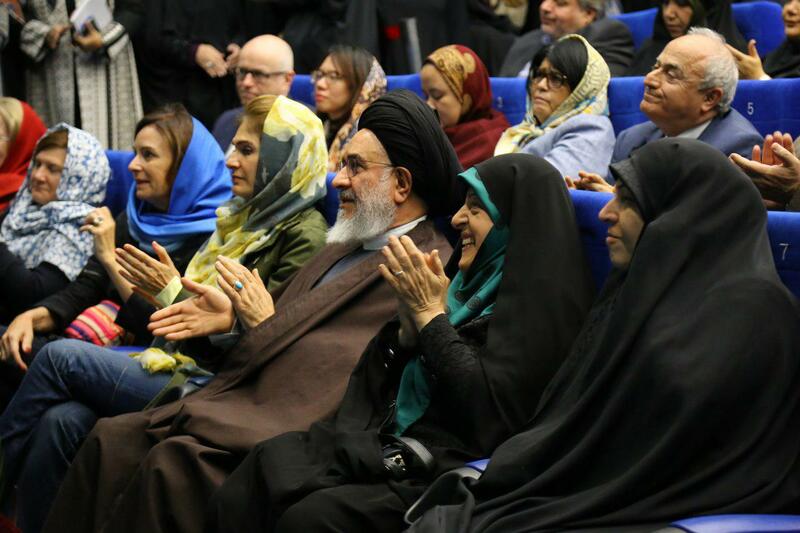 The seminar was addressed by several dignitaries, including Ugochi Daniels, the United Nations Resident Coordinator in Iran; Massoumeh Ebtekar, the Iranian Vice President for Women and Family Affairs; Barbara Rizzoli, the deputy head of the International Committee of the Red Cross’ delegation in Iran; and Mostafa Mohaqeq Damad, a Beheshti University professor. The event was held by the Peace and Environment Centre, an Iranian NGO, in cooperation with the Vice-Presidency for Women and Family Affairs, Iranian Peace Studies Scientific Association, Shahid Beheshti University and other bodies. Houman Liaqati, the head of the Peace and Environment Centre, told IFP News that the conference, which has been held annually for over 10 years, aims to raise public awareness on the effects of war on environment and families. Liaqati said a big number of foreign diplomats had been invited to the conference to be informed of the damages the Iran-Iraq war in the 1980s inflicted on the nation. “We aimed to show we are a peace-loving nation who does not seek war,” he said. 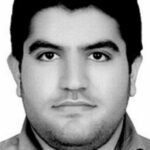 Liaqati said the attendance of a huge number of foreign diplomats shortly after the US government reinstated sanctions on Iran could indicate that the world does not buy US allegations that Iran is fomenting instability and conflict across the globe. 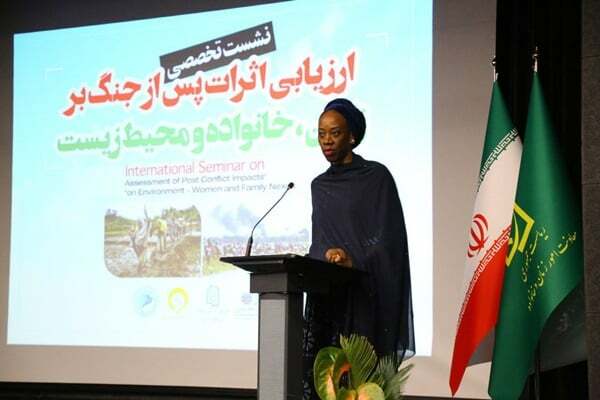 Ugochi Daniels, the United Nations Resident Coordinator in Iran, said in her speech that the conference did a good job in attracting attentions to effects of war on environment, as these impacts are often neglected. “When we mention the brutality of war, we often count the dead bodies, the destroyed homes and the lives ended by violence. Do we pause to consider the environmental devastation that wars cause?” she said. “The toxic legacy of war is often ignored, and with it the long term damage to the health of millions of people struggling to rebuild their homes and their lives,” she said. Daniels said the environment in recent decades been the source of considerable tensions and conflicts. “According to the UN environment agency, over the last 60 years, at least 40 percent of all internal conflicts have been linked to the exploitation of natural resources, whether high value resources such as timber, diamond, gold and oil, or scarce resources such as fertile land and water,” she said. However, Daniels said the environment have also been a source for cooperation and peace. “Conversely, there are many examples of natural resources serving as catalyst for peaceful cooperation and confidence building,” she said. The envoy said the UN works to ensure environment promotes cooperation and peace among nation. “The UN attaches great importance to ensuring that actions on the environment are part of conflict prevention, peace-building and peace-keeping strategies. Because there can be no sustainable peace if the natural resources that sustain livelihood and ecosystems are destroyed,” he said. The envoy said woman can play a critical role in managing natural resources and preventing conflicts resulting from the environment, as they are managing the environment around the world at the family level. “Interventions around natural resources and environmental climate change provide significant opportunities to empower women politically and economically and to strengthen their contributions in preventing conflict and building peace,” he said. Addressing the event, Mohaqeq Damad, a Beheshti University professor, said it’s a pity that mankind has not learned lessons from its past mistakes, which is full of wars that destroyed the environment. He said humans are still engaged in wars that damage the environment and these wars are even more brutal, thanks to modern weapons that have enabled unbelievable death and destruction. As an example, the academic pointed to the environmental damages caused by the Iraqi invasion of Kuwait in 1991. According to a study by Peter Hobbs and Lawrence Radke, who flew through smoke from burning oil wells in Kuwait in 1991 when 4.6 million barrels of oil were burning per day, the environmental damages of the war were very devastating and were anticipated to remain in place for a long time, Mohaqeq Damad said. “Who does build such weapons and destroy environment to earn money? Why shouldn’t we stop them from making these weapons?,” he said. Mohaqeq Damad said he believes there are still wise minds and peace-loving souls across the globe and he hopes that God-willing peace will be created across the world.